Now is the time to expand your capability to absorb these energies by focusing on your center and the love you have for yourself and others. Slow to the beat of your heart and be still, dear ones. Take in your golden breath which is pregnant with so much potential to lift you higher and higher into your rightful place of glory and sweet divine essence. Yes, we implore you to not let this opportunity go by. Pull yourself away from activities and thoughts that bring your energy down into your lower base focus of security, survival and old habits; release your preoccupation with the “how why and whats” of things, and be in the state of clear blue stillness as if you were floating on a placid lake resplendent with sparkle from the sun and allow it to completely support you as you surrender to the stillness and peace of it. Listen to the stillness, feel the stillness, feel the luxury of surrendering to the trust of complete support that the water gives you as you relax into it. And much like a baby who floats in the womb, you are trusting that all is available for your safety and nurturing. But alas, you feel it isn’t enough to just surrender and breathe in the golden light as it comes into you. But it is your job now, dear ones. Take in as much as you can and float upon the celestial energies as they come in, much like you would float on that refreshing body of water you just visualized. Much is being accomplished right now with your acceptance and surrender and receptiveness. Much exists below the surface of it. Much is stirring. All is encompassing. All is well. All is resplendent with each golden breath you take in now. Settle into it and redeem yourself in each moment anew and renewed. In this expansion you have the opportunity to explore many worlds within your very heart, many portals leading to more awakening and expansion. Consider it as many lotus flowers opening within you. Feel the lightness and the freedom of loosening boundaries all around you as you experience the free-floating feeling of meshing with the expanded energies in your Light Body and beyond. It only has boundaries of that which you allow, dear ones. Push them out and expand. Feel the Golden Christed Essence of your Being expand as you envelop the energies and allow them to permeate you. Feel every cell, every light cell welcome the energy and light, the Golden Light, little by little, bit by bit, on-going and ever presently expanding into infinity, dear ones. Ground into the feeling of security this gives you as your Light Body finds a new balance and sense of sureness and placement in complete integration. You are finding a new sense of stability in the very expansiveness and lightness that is so different from your former sense of physicality. Feel the pulsing of your newfound lightness as you move through these energies. 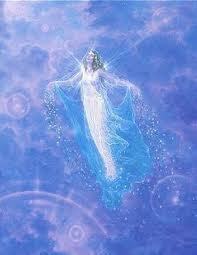 We congratulate you on letting go and feeling and experiencing each portal opening and influx of light. By now you are seeing the opportunities to open your own portals and so it becomes a little mind-blowing as to the possibilities and the awareness you are gaining through this journey. And so you adjust each moment to the new feelings of upliftment and expansion. And we welcome you, dear ones. You are learning to exist on so many levels and to love yourselves as much as we do and we applaud you for that. You are leaving behind those shackles of yesteryear that bound you to limited views of things. You are leaving behind attachments that only served to entrench you deeper into the old realities. You are learning to be free, something that you have not experienced since those lighted years many eons ago when you set out to embark on this journey, that yes, became convoluted at times, but you are pulling out of it, much like a swimmer swims up steadily from the depths of a deep body of water, to finally break through the surface with so much excitement and exhilaration. You are doing that now, dear ones. We love you with our essence, so very deeply, just as Creator does. You are becoming much more comfortable within that love, we see, and that will open even more doors for you. We leave you now to ponder our words and to bask in the glory of your newfound freedom and happiness. My mother is to students of Biblie,and she don,t want to see the true.That the founder of this religious is mason of 33 grad and i don,t know how i can make my mother to understand that she was learned is a lie. Hello! My apologies for not seeing this before. I understand deeply your concern about your Mother. It is really really difficult to see others not understanding or accepting the truth as we see it. My experience and guidance has always been to love them and allow them their differences and be an example for them. All we can do is develop our own truth for ourselves and build our light and love, I feel. Thanks for the words to “be still.” The last couple of days the urgency of it all has prevented stillness to occur for me. However, I am blessed to have a full day (July 29) to “be still” and enjoy the experience. I appreciate your information you give and the service you provide. Thank you, Kerry, my pleasure….many many blessings to you and enjoy the stillness and the experience!